Helensville is a town in the North Island of New Zealand. It is sited 40 kilometres northwest of Auckland, close to the southern extremity of the Kaipara Harbour. State Highway 16 passes through the town, connecting it to Waimauku 16 km to the south, and Kaukapakapa about 12 km to the north-east. Parakai is 2 km to the north-west. The Kaipara River runs through the town and into the Kaipara Harbour to the north. The population was 2,532 in the 2006 Census, an increase of 315 from 2001. 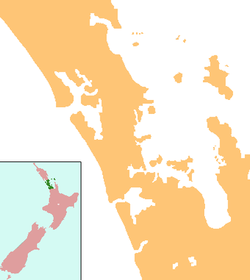 Helensville is also the name of an electorate seat in the Parliament of New Zealand. The current member for Helensville is Chris Penk. The area around Helensville was originally called Te Awaroa, meaning "The long path" or "The long river valley". The first European settlers in the district were Scottish timber millers named McLeod but who had actually come from Nova Scotia to New Zealand. John McLeod built a house which he named "Helen's Villa" in honour of his wife, and the name soon became that of the surrounding settlement. Initial development of the town was around the kauri milling industry, but by the start of the 20th century dairying was becoming of increasing importance. It was also becoming somewhat of a tourist centre, owing to the presence of hot springs 3 km to the west of the town at Parakai. A lot of the early history of Helensville is described in the book Men Came Voyaging written by Colleen Sheffield, who lost her life in a bus accident before the book was completed. Helensville had a local government like other suburbs of Auckland at that time. [vague] The local government was called Helensville Borough Council, which started in 1947 and merged into Rodney District Council in 1989, eventually being amalgamated into Auckland Council in November 2010. Although it is no longer a forestry or dairy centre, the town is still a tourist attraction, largely because of its many historic buildings, the hot springs at Parakai and the Parakai Aerodrome, and its proximity to Auckland. It has also seen positive effects from the nearby wine producing region around Kumeu, 20 km to the south. There are also an increasing number of lifestyle blocks in the area. Kaipara College is a secondary (years 9-13) school with a roll of 767 as of August 2018. The school began as Helensville District High School in 1924, and changed its name to Kaipara College in 1959. Helensville Primary School is a full primary (years 1-8) school with a roll of 510 as of August 2018. It was founded in 1877. Tau Te Arohanoa Akoranga is a satellite campus of the state-integrated Kingsway School, offering a Christian-based education. Helensville railway station is on the North Auckland Line but the station has been closed since 2009. With the cessation of the passenger train service the only public transport between Helensville and central Auckland is by buses to and from Westgate in west Auckland then transfer to another bus route 110 to central Auckland. At rush hours an express bus operates to Downtown. ^ Roger Smith, GeographX (2005). The Geographic Atlas of New Zealand. Robbie Burton. map 34. ISBN 1-877333-20-4. ^ "Kaipara College - ISSCC". International Student Services Center Corporation. Retrieved 2008-08-23. ^ "Helensville Primary School". Helensville Primary School. Retrieved 2008-08-23. ^ "Head of School Welcome". Kingsway School. Retrieved 13 March 2019. ^ "Calls for rail to ease congestion in Auckland's north-west". Stuff.co.nz. 27 September 2016. Retrieved 11 November 2018. Wikimedia Commons has media related to Helensville, New Zealand. Wikivoyage has a travel guide for Helensville.